Every how-to post about increasing engagement, whether for advertising or organic content, focuses on giving users a reason to click, and a new ad product introduced by Twitter Thursday aims to do just that. Twitter head of product, brand and video ads Ilya Brown announced the release of the social network’s conversational ads to all advertisers globally, as well as a new feature, the Instant Unlock Card, in a blog post. Conversational ads, which Twitter introduced in January, gave advertisers the ability to encourage users to interact with their ads via custom hashtags or call-to-action buttons. 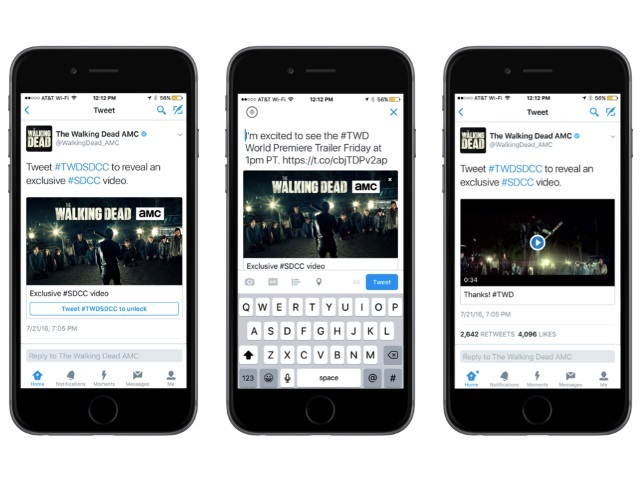 Twitter’s new Instant Unlock Card takes this one step further, incentivizing users to tweet about campaigns by granting them exclusive access to content such as film trailers or question-and-answer sessions after their tweets are sent. These formats are exclusive to Twitter and make it even easier for consumers to engage with and spread a brand’s campaign message. It’s a powerful way for advertisers to extend their presence across Twitter. During the beta, brands saw an average 34 percent earned media rate. That means for every 100 paid impressions, an advertiser receives 34 earned impressions. Twitter also introduced analytics for its Instant Unlock Card, allowing brands to view engagement metrics and earned media generated by their campaigns, and Brown said more detailed insights are available via Brand Hub’s Watchlist feature. And Brown shared examples of early adopters of Twitter’s Instant Unlock card: AMC for The Walking Dead (above), Coca-Cola for its #TasteTheFeeling campaign (below) and Marvel for Captain America: Civil War (below). Readers: What are your initial thoughts on Twitter’s Instant Unlock Card?